The Foundation is to serve the purpose of furthering Swedish-Russian relation through the award of fellowships to young citizens of the Russian Federation. The capital of the Foundation derives from a donation by Ambassador Sverker Åström. The Foundation is called "The Foundation for the Furtherance of Swedish-Russian Relations" and has its seat in Stockholm. The fellowships are designed to allow a number of young citizens of the Russian Federation, aged 20 to 35 years, to acquaint themselves with conditions and achievements in Sweden in their respective fields of interest, such as political science, law, economy and administration. Other fields may include art, music, dance and theatre. Applicants should hold or prepare academic degrees. The intention is that the fellows, through contacts with Swedish authorities, universities, organisations, enterprises and individuals, should acquire knowledge and experience that will be useful to them in their careers in Russia. It is, not least, of importance that they win Swedish friends with whom they will hopefully remain in touch after their stay in Sweden. After the end of their visit the scholarship holders must submit a report to the Board. 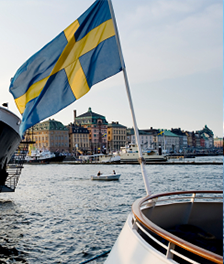 The scholarship is not intended for researchers who are already in Sweden or pursue specialized research in Swedish themes. November 3 a meeting of more than 40 Sverker Aström scholars met a the Swedish Embassy in Moscow to get to know each other and tell about how the scholarship helped them in their future career. A discussion about ”soft projects in hard times” to help the relationship between Sweden and Moscow also took place with the presence of businessman Christoffer Norman and Swedish Radio correspondent Maria Persson Löfreg and the ambassador and scholar Andrei Semenov also took place before the company gathered at a buffet dinner at the ambassador´s residence. The following day Disa Håstad gilded the company through ”her Moscow” in a bus and everybody had lunch at the restaurant Petrovich, now joined by the scholar Julie Terekhova. Standing (from left): Yulia Yakubovskaya with daughter Polina, Anja Fomenkova, Oksana Grigorieva, Anna Varfolomeeva, Daria Bychkova, Alexandra Kuimova, Anna Gorobenko, Youlya Vronskaia, Irina Sotnikova, Olga Amelkina, Anastasiia Rind, Natalja Barabash-Berglind, Nadya Tochilova, Alina Uvaeva, Leta Iugaj, Alena Shihelyakina, Olga Kuvaldina, Yulia Krivtsova, Anna Bulycheva-Ivanova, Sergei Kremnev, the Swedish lector at Moscow university. 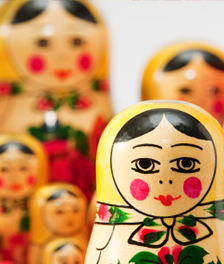 Back row: Georgi Katsitadze, Zhenya Sidorova, Lidia Karpunina, Anna Hizo, Vsevolod Bederson, Andrei Semenov, Sergei Andrusenko, Dilyara Garafova, Elena Alexeeva, Michail Adamov, Andrei Sotnikov, Anna Slapinia, Torbjörn Becker, Ekaterina Erofenko, Grigorij Tsidenkov, , Evgeny Gamerman, Farid Iunusov, Ilia Sidorchuk, Liubov Ermolaeva. Front row: Örjan Berner, Disa Håstad. 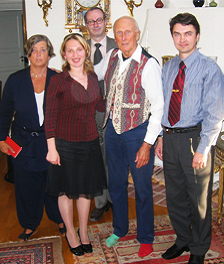 Irina Moutaye with daughter Sara, ambassador Peter Ericson, Dmitry Rudenko. Sitting on the floor: Michael Sohlman. It took ninety five years for Sweden to receive gratitude for the fact that the Swedish Red Cross had saved hundreds of lives during a severe famine in Russia, in the Volga region, erupted during 1921-1923 years. Russian scientist Grigory Tsidenkov the stipendiate of Sverker Åström Foundation conducted a study which revealed how much help to Russia was actually provided by the Swedish Red Cross. 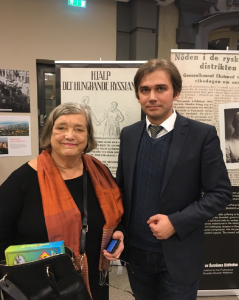 The result of this study was the exhibition held at the Nobel Museum in Stockholm, organized in honor of the 100th anniversary of the Swedish diplomat Sverker Astrom. Later the exhibition was demonstrated and the Stockholm School of Economics. This was the first time when Russia thanked Sweden for its actions during the famine of 1921-1923, says Grigory Tsidenkov. Now, however, the mayor’s office of Samara took the initiative to create a monument to the Swedish Red Cross, the Swedish Prince Carl, who led the action. It is decided to erect the monument at the banks of the Volga river. 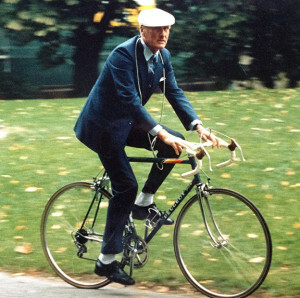 Sverker Åström (1915-2012) was one of the most experienced Swedish diplomats,with a record going back to 1939. For many, he was the architect of Sweden’s neutrality policy, but this never stopped him from pointing out crimes against human rights, committed by East and West. Sverker Åström’s recollections of a long life in the service of diplomacy is, indeed, ”living history”. 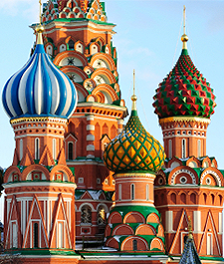 Very early, he developed a keen interest in things Russian – both politically and culturally. He was the author of sharp notes to the Soviet government but also a sensitive translator of Pushkin’s verse dramas. It is no coincidence that his inheritance will serve good relations between Russia and Sweden. Sverker Åström was born in Uppsala in 1915. He took his first degree at the philosophic faculty of Uppsala University in 1935, followed by a law degree in 1939. The same year he was accepted for Swedish diplomatic service with his first posting to Moscow. At the break-out of the war he was evacuated, with other diplomats, to Samara, then Kuibyshev. Back in Stockholm, he worked at the ministry for Foreign Affairs 1943-46; he was transferred to the Washington mission in 1946, returning to Stockholm in 1949 to serve as head of section. He was a counselor at the London embassy 1953-56 and head of the political department of the Swedish Foreign ministry 1956-63. 1964-70 he headed the Swedish delegation to the UN in New York and was the main negotiator for Sweden with the European Community 1971-72. 1972-77 Sverker Åström was Deputy Foreign Minister. 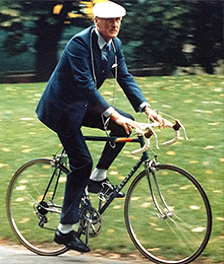 1972-77 his final post was ambassador to France. After his retirement Sverker Åström was an eloquent but sometimes controversial debater in Swedish press and TV. Many readers have been impressed by his translations as elder statesman – of Sonnets by Michelangelo (2005). Sverker Åström has also published his memoirs from half a century in the service of the Swedish Foreign Ministry (only in Swedish), Ögonblick 2003.